Following the deaths of a couple of tourists and a spate of livestock mutilations in the mountains and forests of Norway, the government's official line is that rogue bears are responsible. But the local hunters don't agree and neither does a trio of college students who have been stalking an alleged poacher, Hans, with the intention of making a documentary film about him. Their persistence in pursuing Hans finally pays off when the filmmakers become victims of a night-time attack by something that is obviously much larger than a bear. 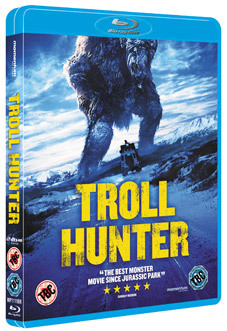 In the aftermath, Hans agrees to an interview in which he reveals the truth regarding his occupation – he is actually a government employed troll hunter. Sceptical, the students volunteer to assist this unlikely hero in his work on the understanding that they will be allowed to document the proceedings and publicly reveal the heavily guarded secrets of a race of creatures thought only to exist in fairly tales. The debut feature from Norwegian director Andre Ovredal, this "original and highly assured fusion of B-movie lore and fairytale terror" (The Hollywood Reporter) combines the vision of Where The Wild Things Are with the faux-documentary, found-footage stylings of Cloverfield, REC and The Blair Witch Project to produce an "enormously entertaining" (Variety) and suspense-filled creature feature that the Daily Star rated as "one of the finest monster movies ever" and Total Film described as being "like David Attenborough taking a stroll into Roald Dahl's brain." One of the biggest hits with audiences at this year's Film4 Frightfest and a major critical success during its subsequent UK theatrical release in September 2011, which saw it earning Four Star reviews in Empire ("spectacular fun"), Total Film (" a true one off... it will quite simply blow you away") and Time Out ("shot through with an unexpected, often unsettling, humour"), the horror-comedy Troll Hunter bursts its way on to DVD and Blu-ray on 9th January 2012 from Momentum Pictures at the RRP of £17.99 for the DVD and £19.99 for the Blu-ray.